Stephen Orr Spurrier (born April 20, 1945) is an American football head ball coach and former player who is currently the head coach of the Orlando Apollos of the Alliance of American Football. Spurrier was born in Miami Beach, Florida and grew up in Tennessee, where he was a multi-sport all-state athlete at Science Hill High School in Johnson City. He attended the University of Florida, where he won the 1966 Heisman Trophy as a college football quarterback with the Florida Gators. The San Francisco 49ers picked him in the first round of the 1967 NFL draft, and he spent a decade playing professionally in the National Football League (NFL), mainly as a backup quarterback and punter. Spurrier was inducted into the College Football Hall of Fame as a player in 1986. After retiring as a player, Spurrier went into coaching and spent several years as an assistant at several college programs, including at Duke University, where he began to develop his innovative offensive system while serving as the Blue Devil's offensive coordinator in the early 1980s. He was hired to his first head coaching job by the Tampa Bay Bandits of the United States Football League (USFL) in 1983. The USFL folded after three seasons, and Spurrier returned to the college ranks, serving as the head football coach at Duke (3 seasons), Florida (12 seasons), and South Carolina (10.5 seasons). Between his stints at Florida and South Carolina, he led the National Football League's Washington Redskins for two seasons. 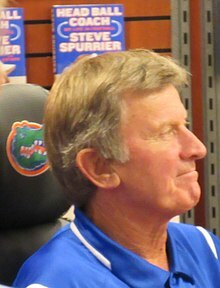 Spurrier retired from coaching in 2015 and became an ambassador and consultant for the University of Florida's athletic department. In 2019, he will return to the sideline as the head coach the Orlando Apollos of the Alliance of American Football. Spurrier's teams were known for winning with high-scoring offenses, and the "head ball coach" also became known for teasing and "needling" rivals both before and after beating them on the field. He is the winningest coach in both Florida and South Carolina program history, and his last Duke squad won the program's only Atlantic Coast Conference (ACC) championship over the last half-century in 1989. Florida's four consecutive Southeastern Conference (SEC) championships in the mid-1990s is the second-longest streak in conference history behind Bear Bryant's 1970s Alabama teams. Spurrier and Bryant are the only coaches to hold the record for most conference wins at two different SEC schools, and Spurrier is second to Bryant in total career wins while leading an SEC program. When Florida quarterback Danny Wuerffel won the Heisman Trophy during the Gators' 1996 national championship season, Spurrier became the only Heisman Trophy winner to coach another Heisman Trophy winner. Spurrier was inducted into the College Football Hall of Fame as a coach in 2017, making him one of four members to be inducted as both a player and a coach. In September 2016, the University of Florida officially renamed the Gators' home field to Steve Spurrier-Florida Field at Ben Hill Griffin Stadium. Spurrier spoke about his NFL coaching experience during SEC Media Days in 2014. "When I left Florida after 12 years, I thought I was going to coach in the NFL five or six years and retire to the beach, and play golf a bunch, and travel around, this, that and the other. But that was a bad plan. It was. Later you found out that was not a real good idea. But that's the way I was thinking back then.". 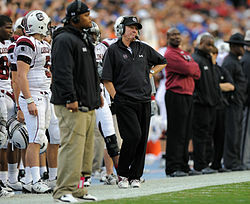 After retiring from coaching, Spurrier further reflected on his NFL stint in several interviews. In a 2016 appearance on the Paul Finebaum Show, Spurrier reflected that the Redskins might not have been the best choice for his jump to the NFL. "I went to the team that offered the most money instead of the best situation", he said. And in 2015, he told David Feherty that, "The owner and the personnel guys, they picked the team. I couldn’t even pick the quarterback the second year. So I knew it wasn’t going to work, but that's ok. I probably didn’t do a very good job, and the situation wasn’t what I was looking for, so it was time to move on." In April 2018, Spurrier was named the head coach of the Orlando Apollos of the Alliance of American Football (AAF), a new spring football league slated to begin play in February 2019. Spurrier was the first coach or player to sign with the AAF. In July 2016, Spurrier returned to the University of Florida to serve as an ambassador and consultant for the athletic program. On September, 3, 2016 the field at Ben Hill Griffin Stadium was renamed to "Steve Spurrier-Florida Field at Ben Hill Griffin Stadium" in honor of Spurrier's achievements at the university. In January 2017, South Carolina Governor Nikki Haley inducted Spurrier into the Order of the Palmetto, the highest honor of the South Carolina government. ↑ "Steve Spurrier: Career Stats at NFL.com". Retrieved September 5, 2016. ↑ Pantages, Will (January 9, 2017). "Steve Spurrier Re-enters College Football HOF". floridagators.com. University of Florida. 1 2 Low, Chris (September 4, 2016). "Swamp Sweet Swamp: Steve Spurrier is back home at Florida". ESPN. Retrieved September 4, 2016. 1 2 3 4 5 6 7 8 9 10 11 12 13 14 15 16 17 18 19 GatorZone.com, Football History, 2001 Roster, Steve Spurrier Biography Archived March 22, 2012, at the Wayback Machine. Retrieved July 25, 2009. 1 2 3 Williams, Trey (October 22, 2015). "Before he was Head Ball Coach, Steve Spurrier was just a kid from Johnson City". The Johnson City News & Neighbor. Retrieved July 30, 2016. ↑ Longman, Jere (September 1, 2002). "With Innovation, Winning Is the Only Thing for Spurrier". The New York Times. Retrieved September 4, 2016. ↑ databaseFootball.com, Players, Steve Spurrier Archived February 12, 2010, at the Wayback Machine. Retrieved July 9, 2010. 1 2 3 4 5 6 7 8 9 10 11 12 13 14 15 16 17 18 19 Spurrier, Steve with Buddy Martin (2016). Head Ball Coach: My Life in Football. New York: Blue Rider Press. ISBN 978-0399574665. ↑ Haney, Travis (October 27, 2007). "Spurrier's Hometown Conflicted". The Post and Courier. Charleston, South Carolina. Retrieved September 10, 2016. ↑ Jenkins, Henry (November 19, 1962). "Sideline Review: Spurrier Widely Sought by Colleges". Kingsport Times-News. Kingsport, Tennessee. Retrieved September 4, 2016. 1 2 Gordon Weidler, "Steve's Story: New Book Unlocks Spurrier Mystery", The Gainesville Sun (September 28, 2002). Retrieved October 13, 2015. ↑ Siler, Tom (September 11, 1964). "College Football Roundup". El Paso Herald-Post. Knoxville News-Sentinel. Retrieved September 4, 2016. 1 2 McEwen, Tom (1974). The Gators : a story of Florida football. Huntsville, Ala: Strode Publishers. ISBN 978-0873970259. ↑ "Harper's Running Sets Florida's Pace". The Progress-Index. AP. September 20, 1964. Retrieved September 4, 2016. ↑ Moffitt, David (October 11, 1964). "Floridians Chew Up Ole Miss". News-Journal. UPI. Retrieved September 4, 2016. ↑ "Spurrier Top SEC Soph". Kingsport Times. Kingsport, Tennessee. UPI. December 15, 1964. Retrieved September 4, 2016. 1 2 3 2012 Florida Football Media Guide Archived May 27, 2013, at the Wayback Machine, University Athletic Association, Gainesville, Florida, pp. 70, 72, 74, 75, 80, 87, 89, 92, 93, 94, 96, 98, 102, 106, 112–113, 116, 122, 124, 129, 136, 141, 142, 144–146, 149–150, 153–154, 155, 157, 165, 171, 182 (2012). Retrieved September 16, 2012. ↑ Mabe, Logan (November 14, 1996). "Heisman was Spurrier's 2nd Best Catch". The Gainesville Sun. pp. 1C, 6C. Retrieved November 11, 2013. ↑ "Sugar Bowl Record Book" (PDF). Retrieved September 4, 2016. 1 2 3 Heisman.com, 1966: Steve Spurrier Archived December 17, 2008, at the Wayback Machine. Retrieved July 25, 2009. ↑ Dirocco, Michael (September 9, 2005). "SEC EXTRA: Payback's for the 'Dogs". Jacksonville Times-Union. Retrieved September 4, 2016. ↑ Low, Chris (September 6, 2013). "Is Steve Spurrier in Georgia's head?". ESPN. Retrieved September 4, 2016. ↑ "Steve Spurrier career statistics". Pro Football Reference. Retrieved September 8, 2016. ↑ Macomber, Frank (December 24, 1972). "Spurrier Extends 49ers QB Dynasty". The Sunday News and Tribune. Copley News Service. Retrieved September 6, 2016. ↑ "49ers to Rely on Passing Game". Panama City News-Herald. UPI. December 23, 1972. Retrieved September 6, 2016. 1 2 Mabe, Logan (November 15, 1996). "Steve Spurrier: #1 Gator". The Gainesville Sun. Retrieved September 7, 2016. ↑ "Spurrier Puzzled, Disappointed by His Release". The Lakeland Ledger. Lakeland, Florida. April 15, 1977. Retrieved September 7, 2016. ↑ "Spurrier Joins Gator Staff". The Naples Daily News. UPI. December 21, 1977. Retrieved July 31, 2016. ↑ "UF Fans can thank Vol's AD for Spurrier". Orlando Sentinel. November 29, 2001. Retrieved January 23, 2016. ↑ UPI (November 20, 1978). "No Title so Florida Gives Ax to Dickey". The Evening Independent. Retrieved January 23, 2016. 1 2 Hamilton, Brian (1979). "Spurrier Joins Coaching Staff". Georgia Tech Alumni Magazine. 55 (3): 12–13. ↑ "Florida football: Gators to rename field after Steve Spurrier". NCAA.com. June 9, 2016. Retrieved September 4, 2016. ↑ Sigiura, Ken (October 16, 2015). "Did Georgia Tech and Pepper Rodgers keep Steve Spurrier's career alive?". Atlanta Journal-Constitution / ajc.com. Retrieved July 30, 2016. ↑ Mell, Randall (September 12, 1993). "Spurrier Enjoys It When He Beats Kentucky". Orlando Sun-Sentinel. Retrieved September 10, 2016. ↑ Kendall, Josh (August 17, 2012). "Spurrier: No Ill Will Towards Bill Curry". The State. Columbia, South Carolina. Retrieved September 10, 2016. ↑ Featherston, Al (November 26, 2009). "Duke Record Book Forever Changed". goduke.com. Retrieved July 30, 2016. ↑ Holliday, Bob (December 5, 2018). "Three decades later, Spurrier's Duke legacy stands tall :". WRALSportsFan.com. WRAL TV. Retrieved December 9, 2018. 1 2 Holliday, Bob (October 14, 2015). "Steve Spurrier's days at Duke". WRAL.com. Retrieved July 30, 2016. ↑ Jenkins, Sally (September 8, 2002). "If Football Is Life, Touchdown Spurrier". The Washington Post. Retrieved October 16, 2017. ↑ "The Miami News – Google News Archive Search". ↑ Zier, Patrick (December 26, 1985). "Buccaneers are also losing at turnstiles". The Lakeland Ledger. Retrieved July 31, 2016. 1 2 Keeley, Laura (August 28, 2014). "Steve Spurrier still remembers his time at Duke like it was yesterday". The News & Observer. Retrieved July 31, 2016. ↑ Low, Chris (May 24, 2012). "Spurrier loves speaking his mind". ESPN. Retrieved July 31, 2016. 1 2 Kallestad, Brent (January 1, 1990). "Spurrier Takes Florida Job". The New York Times. AP. Retrieved September 11, 2016. ↑ Olson, Andrew (3 September 2016). "Head Ball Coach draws a crowd at book signing in Gainesville". Saturday Down South. Retrieved 9 February 2019. ↑ Taylor, John (28 March 2018). "Steve Spurrier open to joining new pro league as Head Ball Coach". NBC Sports - College Football Talk. Retrieved 9 February 2019. ↑ Dame, Mike (May 31, 1995). "Gators Maneuvering to Add Miami to Schedule". The Orlando Sentinel. Retrieved September 11, 2016. ↑ Harry, Chris (August 30, 2016). "'HACKS' LOOK BACK AT SPURRIER'S ARRIVAL, GATORS' REVIVAL". floridagators.com. Retrieved September 11, 2016. 1 2 3 Matthew Zemek, "Urban Meyer, Meet 1997 Archived 2011-07-16 at the Wayback Machine", Gator Country (October 18, 2005). Retrieved July 26, 2009. ↑ Ray Goff responded publicly: "He's a good coach, but I'd like to run into him some night down a dark alley." Jack Hairston, "Spurrier Has Built a Sugar Bowl Legacy Archived 2014-03-25 at the Wayback Machine", Times-Picayune (January 8, 2008). Retrieved July 26, 2009. ↑ Associated Press, "Spurrier resigns as Gators coach", ESPN (January 4, 2002). Retrieved July 25, 2009. See also American Rhetoric, Online Speech Bank, Steve Spurrier: Resignation Speech (University of Florida) Archived August 8, 2008, at the Wayback Machine. Retrieved August 30, 2009. ↑ SECSports.com, Football, SEC Football Roundup - Saturday, September 2nd Archived September 30, 2007, at the Wayback Machine. Retrieved July 26, 2009. 1 2 SECSports.com, Football, SEC Football Roundup - Saturday, September 30th Archived September 30, 2007, at the Wayback Machine. Retrieved July 26, 2009. ↑ "Spurrier, No. 22 Gamecocks clinch SEC East title". ↑ "USATODAY.com – Spurrier preseason era opens with Redskins rout". Retrieved September 5, 2016. ↑ "Redskins vs. Buccaneers - Game Recap - August 24, 2002 - ESPN". Retrieved September 5, 2016. ↑ "Cardinals vs. Redskins - Box Score - September 8, 2002 - ESPN". Retrieved September 5, 2016. 1 2 "Low: Unhealthy culture hurt Spurrier in NFL". 2012-12-11. Retrieved September 5, 2016. ↑ "USATODAY.com – Spurrier quits as Redskins coach". Retrieved September 5, 2016. ↑ Steinberg, BIll (September 30, 2015). "Steve Spurrier says he couldn't even pick his quarterback during his second year with the Redskins". The Washington Post – DC Sports Blog. Retrieved June 12, 2016. ↑ "Spurrier's new plan: Just keep winning". 2014-07-15. Retrieved September 5, 2016. ↑ Gaither, Steven J. (April 20, 2016). "Steve Spurrier regrets Florida departure". Sporting News. Retrieved May 7, 2016. ↑ Schwartz, Nick (September 30, 2015). "Steve Spurrier reveals he wasn't allowed to choose his starting QB with the Redskins in 2003". USA Today. Retrieved October 28, 2017. ↑ Ben Crane, "Coach Gives funds to USC: Spurrier's gift seeks to aid renovations of athletic facilities Archived 2014-02-26 at the Wayback Machine", Daily Gamecock (September 6, 2006). Retrieved July 26, 2009. ↑ College Football Data Warehouse, Florida vs. Mississippi St Archived July 7, 2015, at the Wayback Machine. Retrieved September 4, 2009. Spurrier's Gators lost to Mississippi State in Starkville in 1992 and 2000. ↑ College Football Data Warehouse, All-Time Coaching Records, Steve Spurrier Records by Year Archived February 15, 2010, at the Wayback Machine. Retrieved July 26, 2009. 1 2 3 Alex Riley, "Spurrier's past still outshines his future: Battle with best of SEC leaves Carolina, Florida fans pondering legacy[permanent dead link]", Daily Gamecok (November 13, 2006). Retrieved August 26, 2009. 1 2 Michael Aguilar, "Defense uses 'bend don't break' mantra for win: Stops on Tiger offense allow gutsy Gamecocks to wrangle seventh win[permanent dead link]", Daily Gamecock (November 27, 2006). Retrieved August 26, 2009. ↑ Jonathan Hillyard, "Victory over rival will spark turnaround for USC: Spurrier says Clemson win could get Carolina ready for future success seasons[permanent dead link]", Daily Gamecock (November 27, 2006). Retrieved August 26, 2009. ↑ AP Poll Archive, 2006 Final AP Football Poll Archived August 1, 2009, at the Wayback Machine. Retrieved August 26, 2009. In the final AP Poll, the five teams that defeated South Carolina finished as follows: Florida 1st, Auburn 10th, Arkansas 15th, Georgia 23rd, and Tennessee 25th. ↑ College Football Data Warehouse, South Carolina Coaching Records, Steve Spurrier Records by Year Archived February 15, 2010, at the Wayback Machine. Retrieved July 26, 2009. ↑ "2013 NCAA College Football Polls and Rankings for Week 17 - ESPN". ESPN.com. Retrieved November 30, 2015. ↑ Marx, Bill (April 7, 2018). "Steve Spurrier returns to coaching with new Alliance of American Football". Sporting News. Retrieved April 7, 2018. ↑ Knight, Joey (April 7, 2018). "Steve Spurrier returns to coaching". tampabay.com. Tampa Bay Times. Retrieved April 7, 2018. ↑ Brockway, Kevin (July 29, 2016). "Spurrier named UF ambassador". The Gainesville Sun / Gatorsports.com. Archived from the original on September 17, 2016. Retrieved July 30, 2016. ↑ Low, Chris (2016-09-04). "Swamp Sweet Swamp: Steve Spurrier is back home at Florida". ESPN. Retrieved March 26, 2018. ↑ aknittle@postandcourier.com, Andrew Knittle. "Gov. Haley hands out Order of the Palmetto to her staff, agency heads". ↑ "Hall of Fame Player and Coach Steve Spurrier Joins SiriusXM As College Football Analyst". investor.siriusxm.com. ↑ "2010 Steve Spurrier Ladies Football Clinic". thestate. Retrieved October 13, 2015. ↑ "University of South Carolina Official Athletic Site". www.gamecocksonline.com. Retrieved October 13, 2015. ↑ "Steve Spurrier Ladies Football Clinic a Big Hit". South Carolina Gamecocks. Retrieved October 13, 2015. ↑ Kersey, Jason (March 2, 2016). "Steve Spurrier Jr. joins Sooners' staff in off-the-field role". The Oklahoman. Retrieved May 8, 2016. ↑ "The Orlando Apollos of the Alliance of American Football Announce Full Coaching Staff". Alliance of American Football. December 10, 2018. Retrieved January 7, 2019.